They said they had no choice but to sign a letter of support. This May 3, 2018 photo shows the Kirkeholmen oil tanker anchored outside the Kinder Morgan Inc. Westridge oil terminal in Vancouver, at the end of the Trans Mountain pipeline that begins in northern Alberta. Two First Nations chiefs who signed letters of support for the Trans Mountain pipeline expansion say they don't truly support the project. Chief Robert Joseph of Ditidaht First Nation told the Tracking Trans Mountain team that he felt fighting the pipeline was futile. "At the end of the day, we are not really in favour of any pipeline, but we believe it's going to go through anyway," Joseph said. "They will not listen to anybody and that's the history of consultation with First Nations people ... They consult and go ahead and do what they were going to do anyways." Canada's federal government is buying the existing pipeline and materials for the expansion project from Kinder Morgan for $4.5 billion. The 43 mutual benefit agreements that Kinder Morgan says it has signed with Indigenous groups in B.C. and Alberta will be honoured after the sale, a Finance Department spokesperson told HuffPost Canada in an email. An unnamed federal government source told The Canadian Press on Tuesday that more Indigenous groups support the project than oppose it. But some groups that did sign agreements say there was no other choice. Ditidaht is a nation of 774 members with 17 reserves. Its main community is located on the west coast of Vancouver Island. 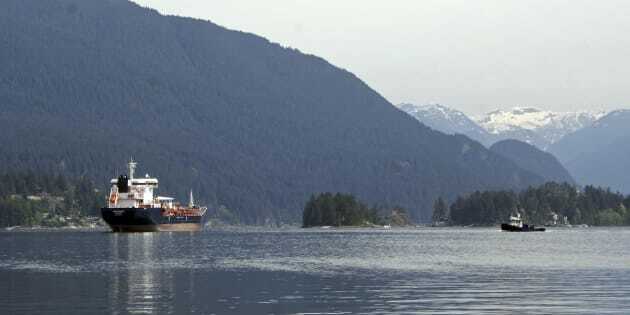 About six kilometres of the shipping route for Trans Mountain tankers falls within traditional territory claimed by Ditidaht in submissions for the B.C. Treaty process. The National Energy Board downplayed the project's effects on Ditidaht in its assessment of the project. Joseph said he worried that if his nation opposed the project, they would be on their own if oil spills. He said the consultation process wasn't meaningful. "Even if it's the best consultation on the face of the earth, if they do what they were going to do anyhow, what's the point?" A spokesman for Minister of Natural Resources Jim Carr said this project was subject to "the most exhaustive review of any pipeline in Canadian history." Extensive consultation with Indigenous people was a key pillar of the government's approach to Trans Mountain, Alexandre Deslongchamps told HuffPost Canada in an email. "Through our review of the Trans Mountain Expansion, we added additional time and steps to the review process to make it more rigorous," he said. "We extended consultation to ensure we were meeting and exceeding our duty to consult Indigenous peoples." Yale First Nation Chief Ken Hansen told APTN News that he wouldn't have signed the agreement if his band had any other financial options. "When I signed this deal, I felt a lot of shame," he said. Yale is located on the Fraser River, about 20 kilometres north of Hope, B.C. The nation has 172 members and 16 reserves. The proposed right-of-way runs about one kilometre away from a Yale reserve, through the nation's asserted traditional territory. When Hansen was elected chief three years ago, his nation was broke. Yale was on the brink of third-party management, a system in which Ottawa places the finances of a nation under the control of an outside trustee. So Hansen said he had to choose between accepting a deal with Kinder Morgan and implementing a treaty negotiated by Yale's previous council with Canada and B.C., which would have relinquished the nation's rights and title to its land. "I literally had my hands tied ... I was in a financial place where I had to accept [the Kinder Morgan] money," he said. The money from Kinder Morgan has helped him build new housing and hire trained professionals to start the nation's climb out of debt. "I'm about the people," he said. "Our people needed help and this is one way of getting it." This story was produced as part of #TrackingTransMountain, a collaborative project from The Discourse, APTN News, and HuffPost Canada that aims to deepen the reporting on Indigenous communities affected by Kinder Morgan's Trans Mountain Expansion Project.